Maintaining a productive garden tests the owner’s organization skills and creativity. As various plants are harvested, empty spots can pop up on occasion. It is important to plant something in these gaps as soon as possible. Otherwise, the barren soil attracts weeds and erodes during storms. Summer squash rewardsat loving care with a massive yield, growing as soon as 4-8 days after flowering and around 50-70 days after planting in early spring to mid-summer. It is recommended to harvest this vegetable before it fully matures, to preserve a soft rind and allow the plant to grow more fruits. An average family typically doesn’t have to plant more than two or three of any variety of summer squash if they harvest properly. While summer squash is best used right after the crop, there are storage options in case you don’t immediately have a use for them. For personal use, store the vegetable in the crisp fridge drawer in a plastic bag, unwashed (water droplets accelerate decay). Even when dry, summer squash is susceptible to chilling damage and deterioration, its estimated storage life being no longer than two days. However, cupfuls of washed, grated product can be frozen for longer periods in zipping closure bags. Summer squash tends to work well with tomato, onions and a variety of herbs and spices (such as parsley, cumin seeds, and rosemary). It can also be used as a side for various meat recipes, which makes it a versatile and efficient vegetable. A staple for aspiring and veteran cooks almost everywhere, bunching onions are easy to grow in large amounts all the way until mid-to-late August. They’re also space-efficient since the bulbs don’t grow as much as some other onion variants. It is recommended to plant them one inch deep and two inches apart in soil that receives full sunlight, and water them twice each week so that the top 5-6 inches of soil remain moist. Harvesting is done once the bulbs are 1-2 inches in diameter. Once the plant is harvested, another set can be put in its place. While the onions grow, you can cut off a leaf at a time when you need it, as long as you don’t take too many. Be warned though; bunching onions do not handle weed very well, so you should keep an eye out for unwanted guests. Beets don’t require much space, so they are ideal for a home garden. They prefer deep, sandier soil as the harder soil makes the root tougher. They want cool weather, so they are not a mid-summer option. However, they can be planted in early spring or fall. You can plant beets in partial shade, but be careful of large tree roots, as those can restrict growth. Just like with bunched onions, 2 inches of space between seeds is a good choice. You should see the plant sprout within the first two weeks. Beet greens (the leaves themselves) can be harvested while the root is still small. Harvesting beets is typically done 6-7 weeks after they are planted. Storing beets is fairly straightforward. You should cut off the leaves about 2 inches from the root to prevent them from stealing moisture. Put the leaves in a plastic bag and use within two days. The roots should be stored in a separate bag with the tail intact, and their storage life is just over a week. Another storage option is to make pickled beets. This extends their storage life significantly (in an unopened jar, pickled beets remain at peak quality for up to a year! They’re still good after that, too), as long as you let them sit untouched for 6-8 weeks first. Spinach is possibly the healthiest vegetable we can grow. It’s a great source of Vitamin A, as well as various minerals and nutrients. You should plant it as soon as you can in early spring. Make sure you organize your working space tightly, as weeds present a big problem for spinach plants. Bury the seeds about 0.5 inches deep and around two inches apart. Spinach does well in both sunlight and shade, making it accessible for many garden layouts. It also doesn’t require fertilization, which means raising a healthy batch of spinach is cheaper than some other veggies! After a surprisingly short time (40-50 days max), you’ll have a large number of healthy leaves to pick (much like you would with lettuce), though be sure to wash them before use. Spinach is stored in a sealed plastic bag, in your refrigerator’s crisp drawer. Be sure not to wash the leaves before storage, as it promotes faster decay. After being cooked, spinach doesn’t last more than a day in the fridge, so be sure to eat it quickly. If you freeze it (after blanching for just a minute or two), it should not be thawed completely before cooking. A popular salad ingredient, radishes are also very easy and satisfying to grow, as they can be harvested after only 3-4 weeks (they are nice and tender when the plant leaves are around 4 inches long)! As long as the soil is clean (no rocks, loose) and you plant them in early spring or early fall, you should see a quick result. Plant them 0.5 inches deep and 1 inch apart to get the most out of your workspace. Make sure the soil doesn’t crust around the plant, as this restricts growth. Also, keep an eye out for weeds, as they will quickly steal the nutrition the radishes require. If you’re looking for easy and fast-growing veggies to stock up on, these are your best picks. 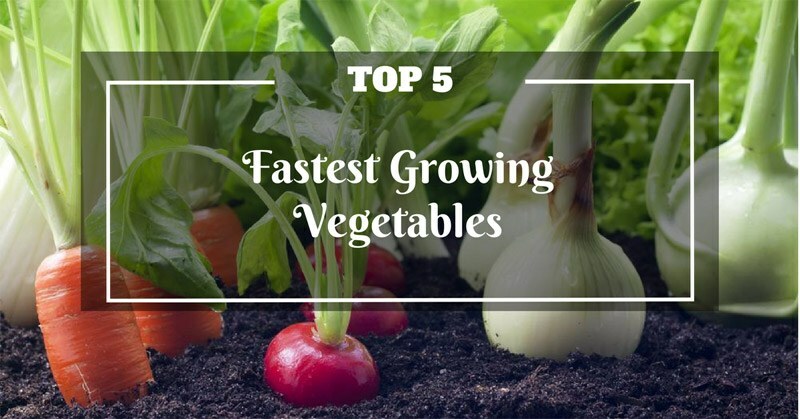 They could serve as a good introduction to growing vegetables if you’re new, and you can use them in all kinds of dishes to ensure a healthy diet.